This article is about the species. You may be looking for Calna Muun, the capital of Agamar; Muun, a Sullustan New Republic General; Raik Muun, a near-Human Dark Jedi; or Muuni, a graceful kelp. "I'm a Muun. There's nothing more sacred to my people than keeping our word in financial dealings." "It's true. Muuns'll take you for everything you've got, but they never cheat." Muuns were a thin, tall humanoid species from the frozen world of Scipio, though they also had a large colony on the mineral-rich planet of Muunilinst. The founders of the InterGalactic Banking Clan, the largest banking organization in the galaxy, Muuns were known throughout the galaxy for their excellent financial and mathematical skills. Seeking economic stability, the Galactic Empire exempted Muuns from their wide-spread non-Human persecution, in order to utilize Muuns and their economic finesse. "If there is anything the Muun detest more than wasteful spending it is nonconformity." Muuns in Harnaidan, the center of economic activity on Muunilinst. "I've always hated your kind." InterGalactic Banking Clan Chairman San Hill. Captured Muuns in the city of Harnaidan on Muunilinst being escorted by Republic clone troopers. 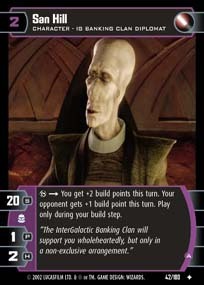 The character of San Hill was created for the movie Star Wars: Episode II Attack of the Clones, released in May 2002, as the leader of the InterGalactic Banking Clan. His name first appeared in a February 2002 article on the HoloNet News website, and a picture of both him and Vo Lapeet appeared in another HoloNet News article one month later. That article also established that the Banking Clan was headquartered on Muunilinst, a planet that had been introduced in Timothy Zahn's 1997 novel Specter of the Past as a financial world. San Hill's species was not named in Episode II, its novelization, nor in much of the movie's supplementary reference books, and instead was first established in Galactic Power Brokers, an article featured in the tenth issue of Star Wars Gamer magazine (May 2002). Two previous Expanded Universe works contain characters who could easily be retconned as Muuns. The first, the animated segment of The Star Wars Holiday Special, contains two unnamed characters on Panna who look like Muuns. When asked, Leland Chee specifically stated that the two aliens may be Muuns. Another possible Muun is Lord Graemon, an Imperial-allied banker who is described as "a lean man wearing the traditional Muunilinsti banker's shawl and pendant" in The Hand of Thrawn Duology. In Star Wars: Empire at War: Forces of Corruption, Muuns are incorrectly depicted as being identical to Humans in loading screens. Wookieepedia has 31 images related to Muun. ↑ According to Ultimate Alien Anthology (p. 101), Muuns are considered venerable at the age of 95. However, Millennium Falcon (pp. 71 & 80) implies that a 90-year-old Muun would be a young adult. Darth Plagueis (pp. 102 & 231) tends to agree more with the Ultimate Alien Anthology information, having Hego Damask advance from a child to an age of responsibility within 25 years.